BAGHDAD (AP) — After years of growing influence, a new sign of Iran's presence in Iraq has hit the streets. Thousands of signs, that is, depicting Iran's supreme leader gently smiling to a population once mobilized against the Islamic Republic in eight years of war. The campaign underscores widespread doubts over just how independent Iraq and its majority Shiite Muslim population can remain from its eastern neighbor, the region's Shiite heavyweight, now that U.S. troops have left the country. 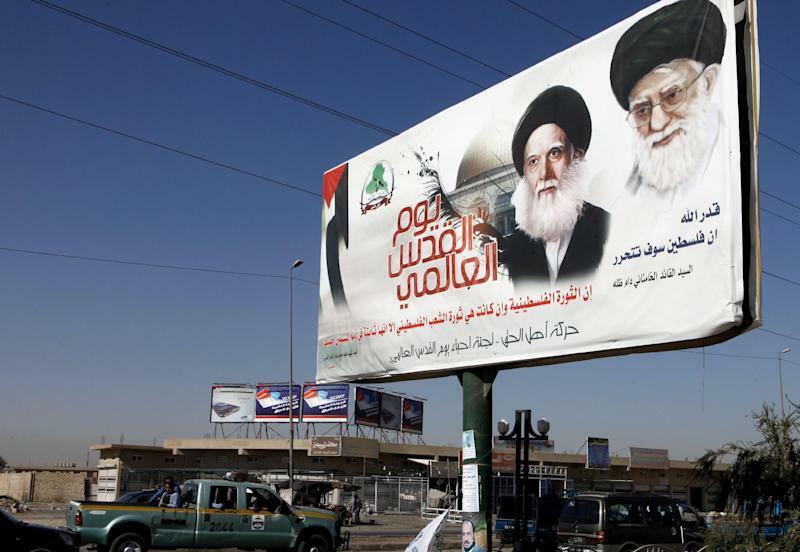 The posters of Grand Ayatollah Ali Khamenei first appeared in at least six Shiite neighborhoods in Baghdad and across Iraq's Shiite-dominated south in August, as part of an annual pro-Palestinian observance started years ago by Iran. They have conspicuously remained up since then. "When I see these pictures, I feel I am in Tehran, not Baghdad," said Asim Salman, 44, a Shiite and owner of a Baghdad cafe. "Authorities must remove these posters, which make us angry." In Basra, located 550 kilometers (340 miles) south of the capital, they hang near donation boxes decorated with scripts in both countries' languages — Arabic and Farsi. A senior official in Baghdad's local government said municipal workers fear retribution from Shiite militias loyal to Iran in if they take them down. He himself spoke on condition anonymity out of concerns for his safety. One such militia, Asaib Ahl al-Haq, even boasted that it launched the poster campaign, part of a trend that's chipping away at nearly a decade's worth of U.S.-led efforts to bring a Western-style democracy here. 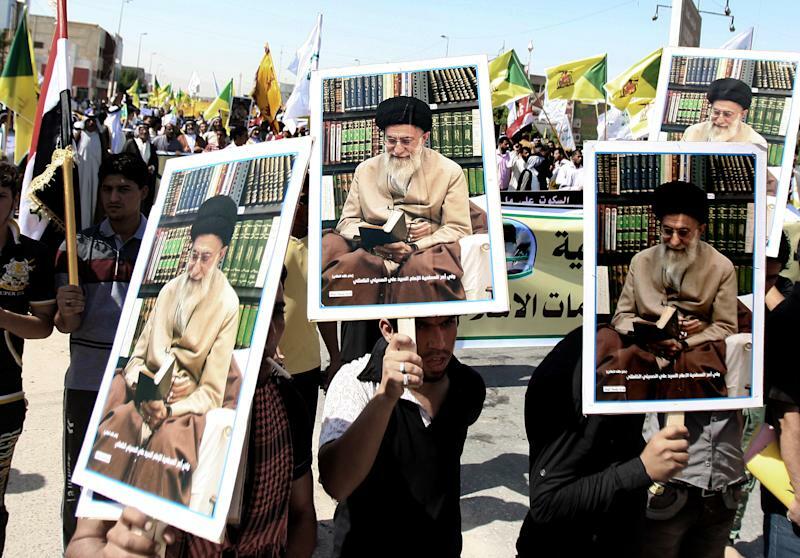 Sheik Ali al-Zaidi, a senior official in the militia, said they distributed some 20,000 posters of Khamenei across Iraq. He said Khamenei "enjoys public support all over the world" including Iraq, where he "is hailed as a political and religious leader." Asaib Ahl al-Haq, or Band of the People of Righteousness, carried out deadly attacks against U.S. troops before their withdrawal last year. This month, the group threatened U.S. interests in Iraq as part of the backlash over a film mocking the Prophet Muhammad. Iraqi and U.S. intelligence officials have estimated that Iran sends the militia about $5 million in cash and weapons each month. The officials believe there are fewer than 1,000 Asaib Ahl al-Haq militiamen, and that their leaders live in Iran. Tensions between Iraq and Iran have never fully dissipated over their 1980-1988 war that left nearly half a million dead. But Iran's clout with Iraq's Shiites picked up after Saddam Hussein's fall from power in 2003, and, in many ways, accelerated since the U.S. military pulled out. Iran has backed at least three Shiite militias in Iraq with weapons, training and millions of dollars in funding. Billion-dollar trade pacts have emerged between Tehran and Baghdad, and Iran has opened at least two banks in Iraq that are blacklisted by the United States. Religious ties also have been renewed, with thousands of Iranian pilgrims visiting holy Shiite sites in Iraq daily, including in Najaf, where Iranian rials are as common a currency as Iraqi dinars, and Farsi is easily understood. The posters may reflect a push among some Shiite groups for a clerical system similar to Iran's. Tehran is widely believed to be lobbying for a member of its ruling theocracy, Grand Ayatollah Mahmoud Hashemi Shahroudi, to succeed Iraq's 81-year-old Shiite spiritual leader, Grand Ayatollah Ali al-Sistani. Al-Sistani opposes a formal political role for Iraq's religious establishment, while Shahroudi is part of Iran's system of "velayat-e-faqih," or rule by Islamic clerics. Iraq's Sunnis and Kurds, however, have no taste for blurring Shiite politics and religion. Ever since the ouster of Saddam's Sunni-dominated regime, political leaders in Iraq have sought to rebuild and strengthen relations with Iran, which has responded in kind. Many of Iraq's Shiites sought sanctuary in Iran during Saddam's reign, and some now hold key government posts. Tehran has not been shy about wielding its influence. It was at Iran's urging that hardline Shiite cleric Muqtada al-Sadr grudgingly threw his political support behind longtime foe Nouri al-Maliki, allowing him to remain prime minister in 2010 after falling short in national elections. In return, al-Maliki last year all but ignored Iranian military incursions on Kurdish lands in northern Iraq. The government also has delayed, and in al-Sadr's case, quashed, arrest warrants on militants backed by Iranian forces and financiers. Still, even some Iraqi Shiites, like the cleric al-Sadr and the cafe owner Salman, advocate retaining strong Iraqi nationalism and their Arab identity instead of becoming a Persian outpost. 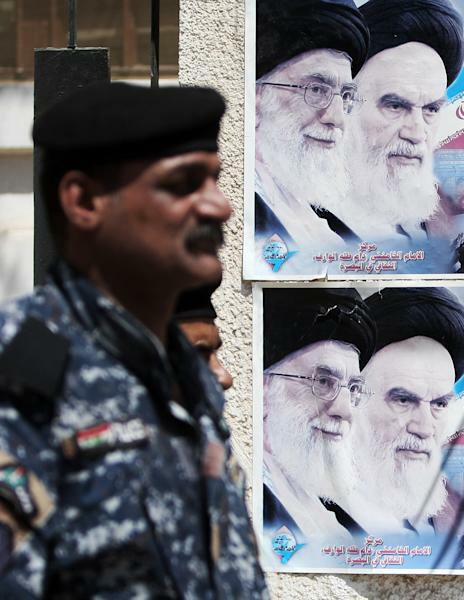 Iraqi government spokesman Ali al-Dabbagh condemned the Khamenei posters and said they could add to the already-strained political unrest in the country. But he said the federal government is powerless to remove them. "These posters are adding a new dispute in Iraq's politics and they might lead to a negative impact," al-Dabbagh said. "The local governments should deal with such situations," he said. Sunnis were less diplomatic in their assessment. Hamid al-Mutlaq, a leading lawmaker, blasted the poster campaign, which he said shows Iran's efforts to amass power in Iraq. Raad Abdul-Rahman, a government worker, said the posters prove that Iraq is becoming "a total Iranian stooge." "In the past, we used to encounter the pictures of the Arab dictator Saddam," Abdul-Rahman said, referring to the posters and statues of the former president that used to be ubiquitous across Baghdad and the rest of the country. "But now pictures of the Persian dictator are taking over."